National Guard Polaris Coastal DragonFire Yokley Racing Team driver William Yokley finished 2nd in the Side by Side 1 Class in Round 7 of the 2011 WORCS Series, and National Guard Polaris Coastal Yokley Racing Team driver Scott Kiger finished 5th in the same Class. National Guard Coastal Yokley Racing ATV Team rider Jarrod McClure finished 6th in the Pro ATV Class. The National Guard Coastal Yokley Racing Team traveled to Glen Helen Raceway in Southern California after a brief summer break. Glen Helen hosts many different types of off-road races, including the AMA National Motocross Series. The course features a pro style mx course with many steep hills and lots of natural elevation changes. The weather was sunny and 85 degrees. William Yokley was in 4th place after the first turn, with teammate Scott Kiger right behind. 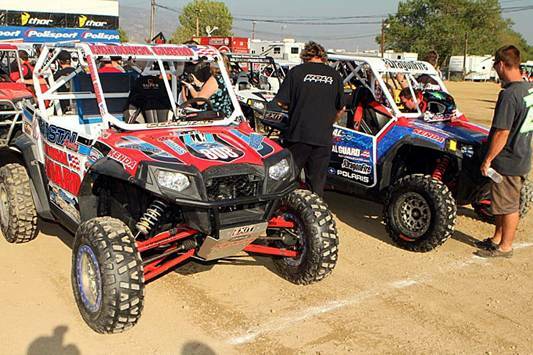 The two National Guard Coastal Polaris Ranger RZR XP900s moved up to 2nd and 3rd going into the second lap. They stayed in those positions for the next several laps. Scott dropped back to 5th place after damaging his front differential on one of the many rocks. William had a nice battle with the lead machine, finally finishing in 2nd place, and Scott coming home in 5th place. The course was pretty rough, with many sandy washboard sections with choppy, square-edged whoops. Both machines ran strong and cool, thanks to their large capacity radiators and cooling systems built by Fluidyne Powersports. Yokley increased his lead in the WORCS season points, and Scott is in 4th. The next side by side race is the GNCC in St.Clairsville Ohio on October 8. Jarrod McClure traveled straight from the GNCC race in New York last weekend to California to prepare for this weekend’s WORCS race. He got a poor start, and was toward the rear of the field on lap 1. He steadily worked his way forward on his National Guard Coastal ATV. 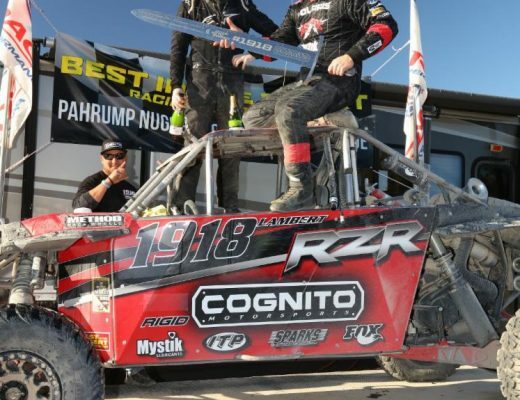 His progress slowed toward the end of the 9 lap race when he damaged a rear wheel on a rock. This caused his machine to veer off line when he accelerated. Jarrod finished in 6th place at the end of the 90 minute race. He is in 6th place in WORCS season points. Jarrod liked the track, but said the many rocks were quite a challenge. Jarrod will travel back across the country to next week’s GNCC ATV race in Somerset Pennsylvania.